100's of photos of our hunts and area. 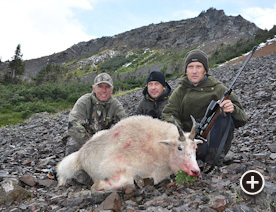 Our season is quite long from August 6th to October 6th but short hair in early August and bad weather in October places most of our mountain goat hunts into September. The weather is usually stable and the goats’ coats are getting nice as fall sets in and provides us with the first frosty nights. 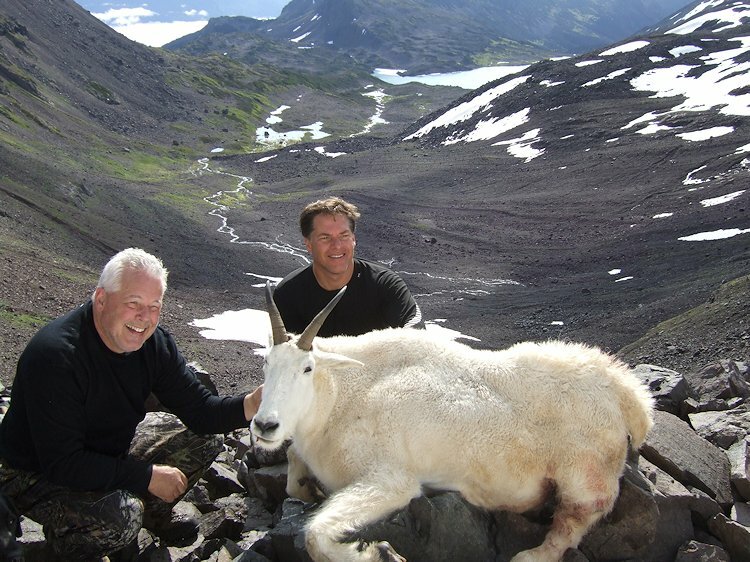 The Skeena and Omineca Mountains of British Columbia are well known for producing record book quality mountain goats. Our goats range in size from 9” to 11” with an average of 9 ½” and our success is usually 100%. 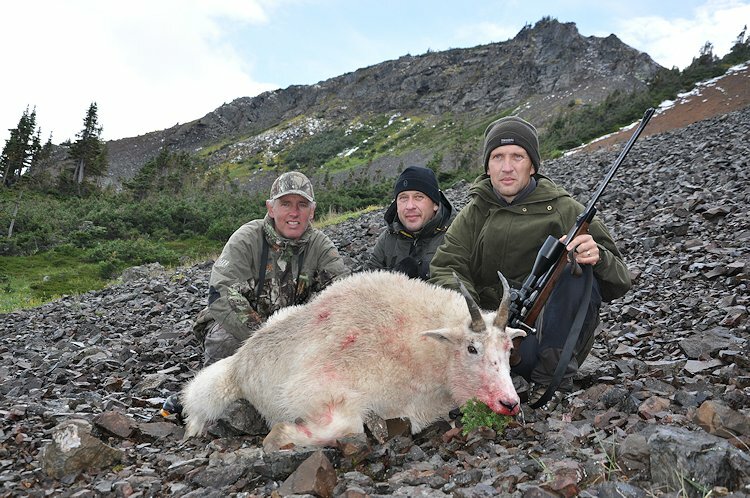 The reason for our great success on mountain goat hunts is the terrain. 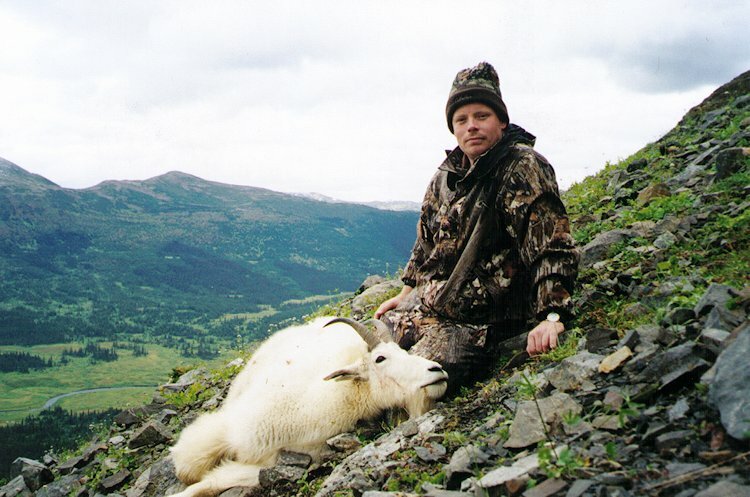 We hunt our goats between 5,000 and 6,000 feet in elevation. In several locations, the hike to the tree-line is only 2 to 4 hours and the use of some cut trails make it quite manageable for most hunters in good physical condition. Our guide area also has some very remote goat hunting locations where the hike through the forest takes you to some ranges that have possibly never seen hunters before. 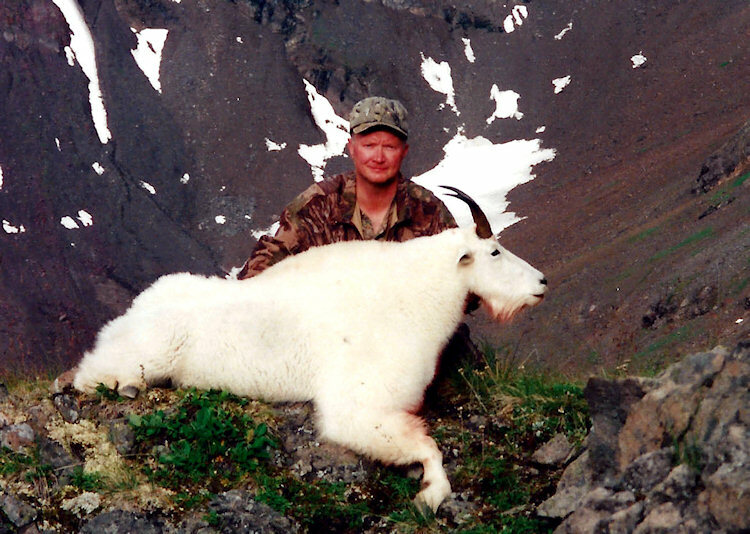 These goat hunts are as physically demanding as one would expect but can produce some great trophy Goats! 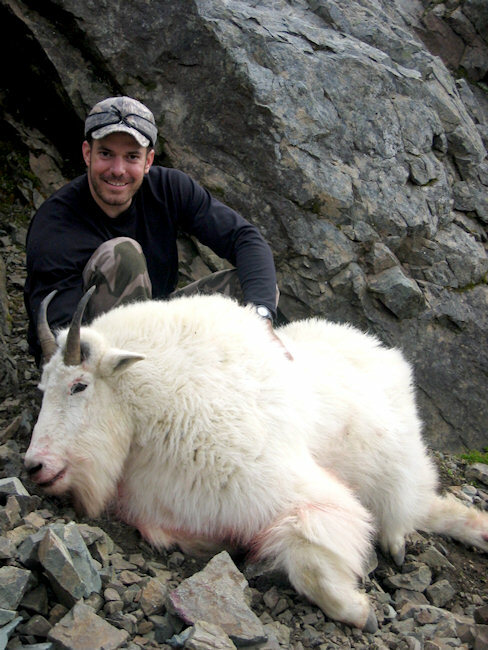 The Skeena and Omineca Mountains in our area have produced numerous record book mountain goats over the past decade. 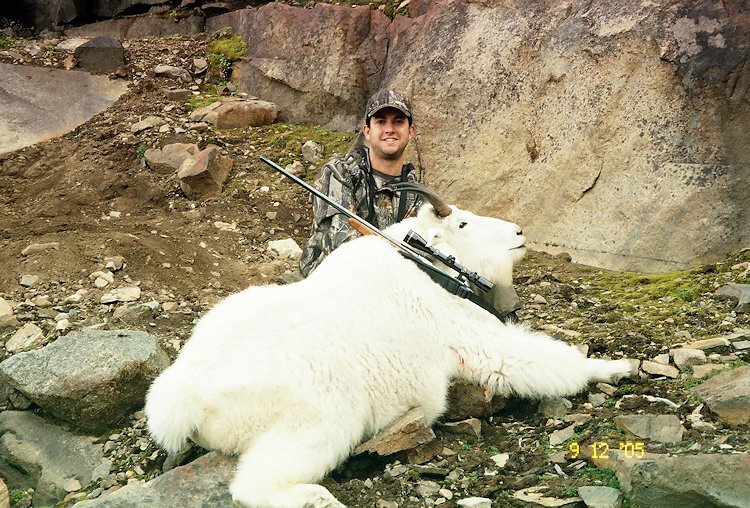 We have three locations that we recommend to seasoned hunters that are still in relative good shape but can’t do the steep climbs or bush-whacking grunts that most mountain goat hunts are so well known for. If you are not confident in your physical ability to do a goat hunt please give us a call and we will describe these “easier” locations in detail to you and let you decide if that could be right for you. These majestic animals live between elevations of 5000 and 6000 feet. Typically we fly into one of our base camps onto a lake or landing strip. From there we take our mountain tents and supplies and hike up to tree-line. 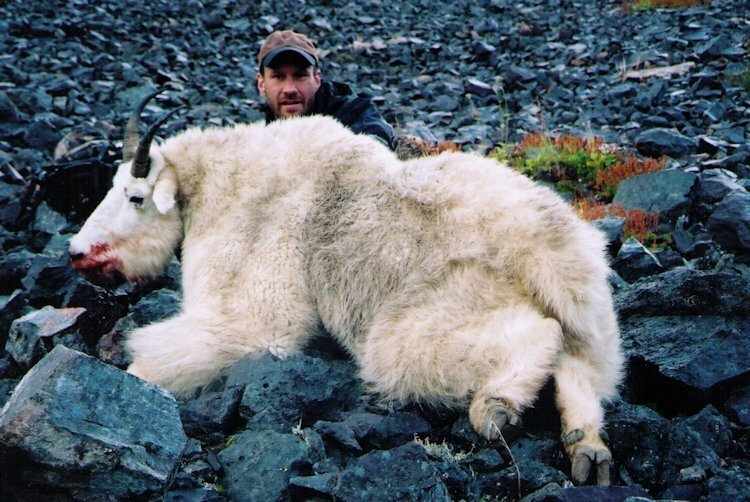 Mountain goat hunting can last anywhere from 2 hours to 9 days, depending on the weather. To hunt mountain goats in Canada, the hunter need not be a marathon runner but should be in fairly good shape. The better your condition, the more you will enjoy your goat hunt. We also have some great locations that lend themselves to combination hunts for goat, moose, grizzly bear, black bear and wolf. Included: all ground transportation, accommodations and meals in the area during the hunt. Also included, one mountain goat and any wolves harvested. Not included: Hunting license $180, species license for; goat $350, moose $250, grizzly bear $1030, black bear $180, wolf each $50, Fishing License $89, Hunter Preservation Fund $200, CITES $30, charter flight to fly-in camps $1100, Taxes. We also have drive-in, back pack goat hunts available that will save you the charter fee.